The Hornet has seen combat in many parts of the world and is one of the principal multi-role combat aircraft for the US Navy, US Marine Corps, Royal Australian Air Force, Canadian Armed Forces, and more. The FA-18C was an evolutionary development of the Hornet, providing more modern avionics and weapons capabilities to the fleet. Even so, this aircraft moved into second echelon operations when the FA-18E/F Super Hornet assumed the role of fleet fighter and all-weather fighter-bomber roles. 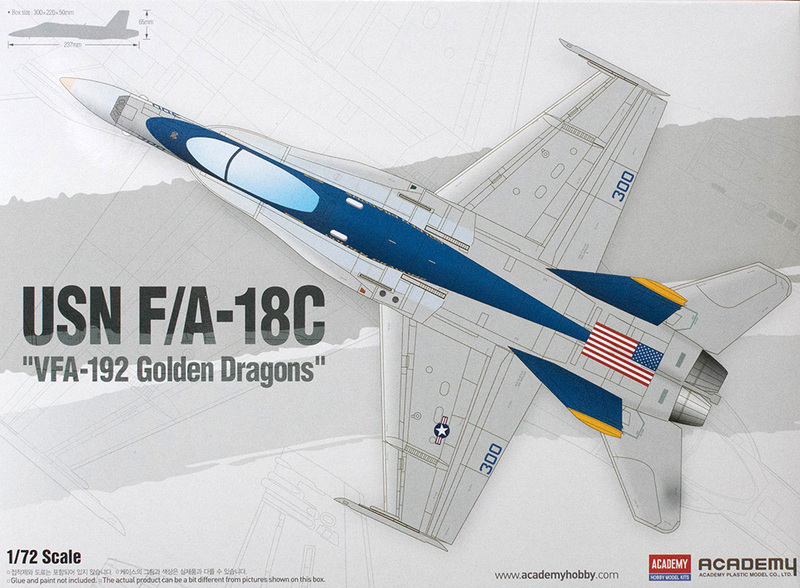 Academy has reissued their 1/72 F/A-18C, this time providing a selection of color schemes for the aircraft in service with the Golden Dragons. This kit is molded in light gray styrene and presented on four parts trees, plus a single tree of clear parts. Like many F/A-18A/C kits, this model has both front and rear cockpit tubs molded as one piece, though only the front cockpit is built up and visible after assembly. The kit also has separately molded stabilators that can be appropriately positioned. Likewise, the speed brake can be posed open or closed. Finally, the canopy can also be posed open or closed. Speaking of the canopy, you can't really see the protective shields that are molded on the clear parts tree to keep the windscreen and canopy parts from getting damaged. I'd like to see more manufacturers adopt this practice to get your clear parts safely home. With two version's of CAG's aircraft and two line aircraft examples, you have an interesting cross-section of schemes to depict this aircraft. The selection of armament will also provide some options for depicting the aircraft on a combat cruise or training. Whatever your choices, this Academy kit is still a nice kit of the venerable Hornet.